One-of-a-kind and very limited production necklaces by Brynn, a La Jolla, California designer who appreciates lovely pearls and gemstones, putting them into striking larger and chunkier necklace styles. 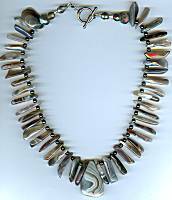 18 inch necklace is graceful fan of BOTSWANA AGATE spears alternated with HEMATITE beads. The agate is irregularly shaped and highly polished, about 1 inch long, natural colors of gray and beige in translucent bands. The central pendant shows the natural banding beautifully. Sterling toggle clasp in back has some crystals and a pair of LABRADORITE beads to each side of it before the agates begin.